Well, Frederick Leighton Elementary School art teacher Michele Scoville recently saw a humanitarian fundraiser to assist the victims of the March 11 massive earthquakes that struck Sendai, Japan. The resulting tsunami ravaged the coastline. 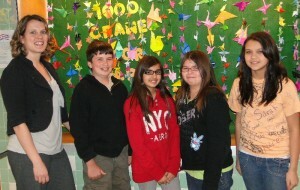 Nearly 300 cranes are displayed in the art room display case at Leighton as students are attempting to construct 1,000. Among those creating the cranes are (left to right) teacher Michele Scoville, Sam Gilbert, Lisa Kanbur, Paige Thomas and Brandy Ermini. In response “Students Rebuild” partnered with “DoSomething.org” to ensure students worldwide have a way to support their Japanese peers. The end result will be a generous donation to the earthquake victims. The goal is 100,000 cranes which will be then woven into an art installation which would be a symbolic gift from youth worldwide to their Japanese peers.